Valvular aortic stenosis, as the most common valvular heart disease, is often a disease of old age and a result of atherosclerotic changes. 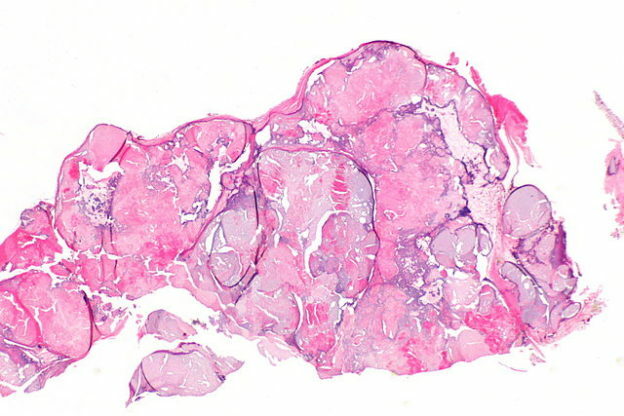 Rheumatic forms have become rare in industrialized countries. It remains asymptomatic for many years in 50 % of cases and is associated with a good prognosis. If the disease becomes symptomatic, the prognosis worsens to a 2-year survival rate of less than 50 %. The term valvular aortic stenosis refers to a narrowing of the orifice that connects the heart and aorta. Often, the term aortic stenosis is used synonymously, although it refers more specifically to a narrowing of the valve. Valvular aortic stenosis is, with 43 % (in Europe and North America), the most common valvular heart disease. In over 65-year olds, valvular aortic stenosis has a prevalence of more than 3 %. Causes of valvular aortic stenosis can be calcifying processes that are common, especially among over 65-year olds (bicuspid valves are affected earlier by atherosclerotic processes). Rheumatic valvular aortic stenosis has become rare in industrialized countries because the responsible streptococcal infections are treated with antibiotics early on. Congenital forms of aortic stenosis are also possible. A distinction must be made according to their localization into valvular, supravalvular and subvalvular aortic stenosis. 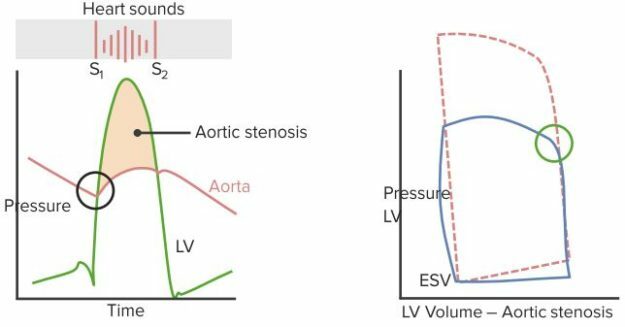 In valvular aortic stenosis, the left ventricle has to use more strength in order to maintain the cardiac output against a pathologically increased pressure gradient of the valve. 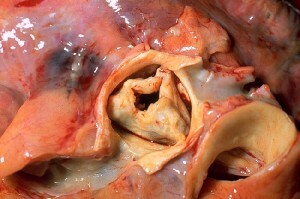 This results in a concentric hypertrophy of the left ventricle. In the long run, this creates a diastolic dysfunction, resulting in pulmonary congestion and signs of heart failure. CAVE: Patients who suffer from a mild valvular aortic stenosis can remain asymptomatic for a long time! After strenuous exercise, syncopes and dizziness are often present because the head, as well as the peripherals, are receiving poor circulation. With hypertrophy of the heart, the coronary perfusion decreases, and this may lead to angina pectoris. Cardiac output decreases during the progression of the disease. Signs of heart failure are clinically apparent. In asymptomatic patients, a valvular aortic stenosis can lead to sudden cardiac death. Upon exam and palpation, the left ventricular hypertrophy manifests as a visible and palpable heaving and widened apical impulse. A buzzing can be heard above the aorta and the carotids. 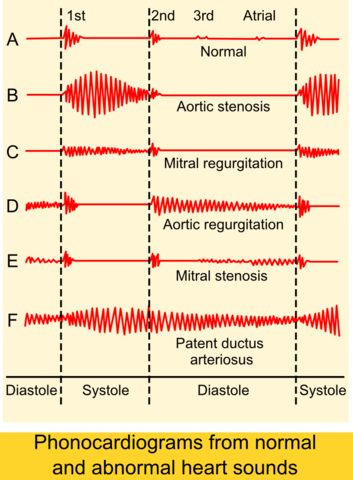 In auscultation, systolic crescendo-decrescendo murmur (diamond shape) is best heard at the right 2nd intercostals space (first aortic area) and radiates to the carotid artery. The carotid pulse is slowly rising. Valsalva and standing → decrease the venous return → decrease the ejection fraction → decrease the murmur. The second heart sound can be breath-dependent, and it may be cleaved paradoxical, especially with a higher-grade stenosis. ECG changes, such as a T-negativity in V4-6, are attributed to left ventricular hypertrophy, but can also be completely absent. Using echocardiography, the stenosis can be classified into a mild stenosis (valve area > 2 cm2), moderate stenosis (valve area 1.1 to 2 cm2) and severe stenosis (valve area < 0.75 cm2). 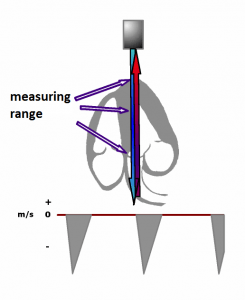 Doppler sonography can be used for determining the flow velocity at the stenosis. A cardiac catheterization provides information on the pressure gradient but is usually only used when another diagnosis was not sufficiently enlightening. For the treatment of valvular aortic stenosis, a surgical aortic valve replacement, as well as a catheter intervention, can be used. A surgical valve replacement is associated with a surgical mortality rate of 3%. The Transcatheter Aortic Valve Implantation (TAVI) introduces a biological valve sewn into a stent through the femoral artery or transapically. Currently, this process is only used in patients with a high surgical risk. Attention: A treatment with only medication does not exist. Endocarditis prophylaxis is no longer indicated! Aortic valvular replacement is the only effective method in treating aortic stenosis. Complications of aortic stenosis are arrhythmias and sudden cardiac death, as well as left ventricular failure. As an existing CHD is a risk factor for the development of aortic stenosis, it is important to avoid this. Hall, R. J., Mathur, V., Bush, H. S., & Texas Heart Institute. (1988). Aortic stenosis. Houston, TX: The Lab. Hansen, P. F. (1967). Aortic stenosis: Haemodynamic and clinical findings in 56 patients. Copenhagen: Munksgaard. Risteski, P., Zierer, A., Papadopoulos, N., Martens, S., Moritz, A., & Doss, M. (2011). Aortic Stenosis: Geriatric Considerations. 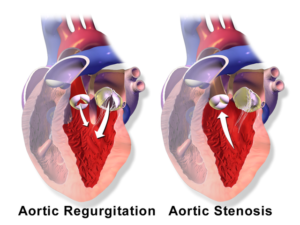 Aortic Stenosis – Etiology, Pathophysiology and Treatment. doi:10.5772/20812. Vukas, M. (1977). Congenital aortic stenosis: A clinical and experimental study on the influence of valvular pathoanatomy and myocardial vibrations on cardiac function. S.l.